Habitat: Acid soils on high mountain areas, at the altitude of 1500 to 2500 meters. 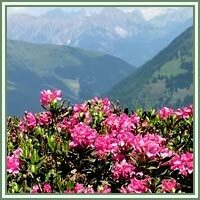 Native to Alps, Pyrenees and Northern Apennines. 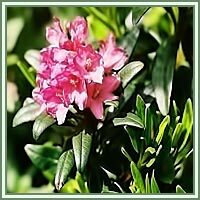 Description: Evergreen and durable shrub. Leaves are oval, egg-shaped and fleshy. Their upper side is dark-green, and the underside is first light green, and then develops a chestnut color with rust-brown spots. Grows up to 1 m. Starts to bloom in July, and continues throughout the summer. Flowers are bell-shaped and pinkish-red in color. Parts used: Leaves, shortly before blooming, and used immediately. Medicinal use: The plant is generally considered to be antirheumatic, diuretic and diaphoretic. Useful in treatment of arthritis, muscle pain and gout. Safety: The plant is moderately toxic, due to the presence of arbutine, aricoline and rhodoxanthine. Improper application can cause vomiting and difficulties of the digestive, nervous, respiratory and circulatory system. Some herbs could react with certain medication. Therefore, it is advisable to consult your doctor before consumption of any herb.